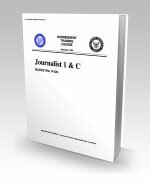 14129.pdf - Pages: 454 - 14129 Journalist 1 & C - Describes the principles of accomplishing the following tasks: managing a public affairs office, public affairs in adverse news situations; operating a command information bureau (CIB); dealing with the mass media; developing and implementing a community relations program; planning and staging special events; preparing and giving speeches; operating a speakers bureau; managing the staff of a civilian enterprise (CE) or funded newspaper; managing a Navy Broadcasting Service (NBS) detachment; and conducting audience surveys. 14130.pdf - Pages: 500 - 14130 Journalist 3 & 2 - This NRTC address the following subject matter areas: basic news writing, writing for features, speeches, sports, accidents, magazines, advance stories, follow-ups and rewrites; copy editing, gathering and disseminating Navy news; writing for publications, headlines, and cutlines. It also addresses legal concerns, photography, photojournalism, broadcast writing, radio and television operations and interviewing, public affairs operations and fleet hometown news. 14208.pdf - Pages: 226 - 14208 Photography (Advanced) - Provides information and advanced techniques involved in Navy photography. It includes basic photojournalism; photographic quality assurance; electronic imaging; aerial photography; and supply and logistics. The silver recovery program and basic operator troubleshooting are also addressed. 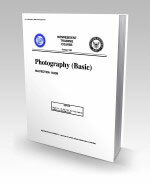 14209.pdf - Pages: 480 - 14209 Photography (Basic) - Provides the basic information and techniques involved in Navy photography. 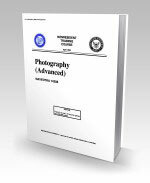 It includes theory of light and optical principles; light sensitive materials; photographic filters; still cameras and controls; basic photographic techniques; photographic assignments; portraiture; copying; chemical mixing; image processing and control; black-and-white printing; color printing; motion media; and job control and photographic finishing.